5 and 8 megapixel shooters have been around for a while now, giving small cameras a run for their money. Well, the 12 megapixel monsters have arrived and can they kick the low and mid-range digicams out? Of course Not. camera Phones are still limited compared to even the most basic of point-and-shoot cameras, mainly because of the optical zoom factor. Otherwise, they have the potential to compete against stand alone cameras. We will have a look at the future of camera phones in this battle between two great phones that compete for glory than anything else. 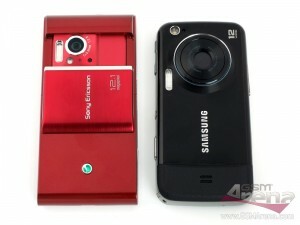 We’ve got two contenders here – The Samsung M8910 Pixon12 and the Sony Ericsson Satio. Each has it’s own advantage and both live up to expectations, giving quite a challenge to conquer the title. Note : The Comparison is made only with the Camera on Focus. In other words, the cameras of the two phones are compared below. The Samsung Pixon12 comes with a 30mm wide-angle lens, which gives it roughly 17 percent wider field of view than the Satio’s regular 35mm lens. Wide angle lens is pretty useful when taking landscape and group photos. However, we lose some detail as more objects are covered in the same number of pixels. Samsung seems to have a tad better edge-to-edge sharpness, with the Satio lens showing some corner softness. Both the lenses are equally good, showing no sign of chromatic aberrations, even in extreme conditions. They were also both nicely resistant to flare. Resolved detail can’t be compared head-on due to the different widths of lens, but with equal framing (keeping the 2 phones at different positions), Pixon12 very slightly outdoes the Satio. The Dynamic Range or the light range (from near-black to near-white) that can be captured by the sensor has a great effect on the image quality. Both these have their dynamic range pretty much equal, thus giving a similar level of detail under various light conditions. Satio loses a lot of fine detail, due to the aggressive noise reduction algorithm. Despite its aggressive setup, the Satio noise-reduction still doesn’t deliver completely noise-free photos. There’s almost the same amount of noise in the Pixon12 images, but it’s the worse looking chroma type, compared to the Satio’s smooth chromatic noise. It is worth noting that the colored noise is virtually impossible to get rid off and it is preserved to a much larger extent when downsizing the images. The film-grain-like noise in Pixon12 is both more tolerable to have in your photos and easier to hide with noise suppression on the computer. The two handsets deliver pretty similar images as far as color rendering is concerned, though there are slight differences in the image processing. Here, the images taken on Satio look a tad punchier than that of Pixon12. This aspect can be a decider when it comes to choosing a camera phone. 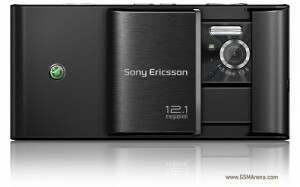 Both the Sony Ericsson Satio and Samsung Pixon12 combine the advantages of the LED and Xenon flash. The Samsung Pixon12 has the clear advantage here. It manages to produce better exposed shots, while keeping the ISO lower. The Sony Ericsson Satio also lacks a “Forced ON” option for its Xenon Flash, meaning that one can’t use it to fill light in back-lit portraits in the day. When the subject is out of the flash range, the two camera phones do not sacrifice on low-light performance. If you are a seasoned photographer and want to fiddle with you own settings, it must be noted that the Satio doesn’t have an option to set an ISO unlike the Pixon12. Under some light, say at dusk, with auto mode the Pixon12 uses ISO 100 and gives a shutter speed of 1/28s. The Satio uses its base ISO 80 with a shutter speed of 1/15s, which makes it almost impossible to hand hold without inducing camera shake blur. Still both camera phones exposed the scene equally. Under almost complete darkness, the Satio goes for 1/8 s and ISO 320, while the Pixon12 chooses ISO 250 and a speed of 1/15 s. That way the Samsung image comes up with a less noise and is easier to hand-hold, but the scene gets underexposed. When it comes to exposure and focus performance, the two phones have their own plus points, yet both of them have good focus accuracy. The Samsung M8910 Pixon12 is a lot better than the Satio in well-lit conditions being much faster in obtaining focus lock. The Sony Ericsson Satio is faster in low-light and close-up focusing. It can focus from shorter distances and achieves quicker lock when the subject isn’t properly lit. The Samsung is sluggish under such conditions. 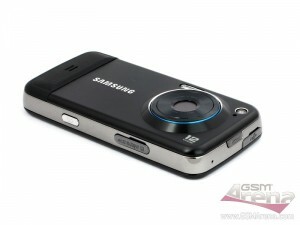 Both of them are quite poor when compared to Samsung S8300 UltraTOUCH and the 720p-capable Samsung i8910 Omnia HD. The Satio manages VGA video @ 30fps and the Pixon12 goes higher to D1 @ 30fps. The colors have better vibrancy in the Satio and the compression applied in Pixon12 is just too much to handle. These two reasons give the Satio an edge. All the regulars on digital cameras are now on-board these two phones. White balance, scene modes, self-timer, color effects, exposure compensation, dedicated macro mode etc., are available. Both the phones offer Touch Focus and the Pixon12 outdoes the Satio by offering object tracking. The Samsung Pixon12 offers a choice between Auto and specific ISO settings ranging from 50 to 1600. The Sony Ericsson Satio doesn’t have manual settings for the ISO, instead it relies on Scene modes that pick the proper ISO setting among other things. Sony Ericsson Satio comes with the BestPic mode to take up to 7 images in a row at the highest resolution and then you can pick the best out of it. In the Pixon12, the continuous mode takes only VGA pictures, hence not at all satisfactory in this aspect. Both the phones provide advanced features like Panorama Mode, Geo-Tagging, Digital image Stabilization, Face and Smile detection, and perform equally well. The Pixon12 offers blink detection, which detects if someone blinked and warns you promptly, but only after the shot is taken. Pixon12 can take 120fps slow-motion videos at QVGA resolution. The slow motion video recording is a really neat trick that is nice to have on-board. It is a tight call as both of them are extremely good and live up to the mark. But when one has to be chosen, Pixon12 will be the choice. It beats the Satio in terms of overall image quality. The output is better in the elements that are considered most important for producing better shots in real life scenarios. With more manual control over the shooting process and the better assortment of high-end technologies, Samsung Pixon12 delivers a better camera experience. It is important to emphasize that the Pixon12 wins by a very small margin. Satio’s camera is extremely good and you don’t have to regret or worry if you have bought the phone.